Are you splitting the bill? By Mateusz Mucha, James Mathison and Kacper Pawlik. How to use our gratuity calculator? When to tip? Why should we do it? How to tip different services? Pizza tip calculator. How much to tip pizza delivery? The tip calculator is a useful tool for everyone who goes out to a restaurant, bar, or anywhere else you are supposed to tip. If you have ever had a problem figuring out how much to tip, read on. We also cover the topic of tip definition and explain to you how to calculate a tip by yourself. You will learn step by step how to use our gratuity calculator and its brand new functionality – the pizza tip calculator. Now you will know how much to tip on pizza delivery! In the last paragraphs, we will take you on a trip around the world and explain how to tip to show your respect to locals. You will see the differences between the rules of tipping in Spain and the culture of tipping in France. Finally, you will learn why tipping in Japan might not end up well for you! A tip is a small amount of money that we give to someone who provided us with a certain service as an additional way of expressing our gratitude. Apart from this, we normally also pay the stated price for the goods and services we receive. Nevertheless, this money usually goes to the owners of the facilities and firms that we visit, not to the person that serves us. Places in which we tip the most are, without a doubt, restaurants, cafes, taverns and other places linked to gastronomy. We tip bartenders for preparing our alcohol drinks, baristas for providing us with coffee and waitresses for taking our orders and bringing food to our tables. Other facilities whose employees count on our tips are hotels and hostels. We may tip hotel porter that carries the luggage to our room, maids that clean our room after or during our stay, and hotel room service personnel that brings food or a bottle of champagne 😉 up to our room. However, there are many other situations and places in which we may, or even should, tip. Tour guides often make a living from the tips that they receive. Pizza (and other food) delivery boys may deserve a tip after driving to us in the rain and late at night. We can show our gratitude to hairstylists, barbers, and cosmeticians for making our hair, beard, and nails. Finally, we can pay taxi drivers some extra money for driving us from one place to another or waiting for us for a long period. There is an option to tip in the Uber app, as well. ($12.08 / 2) + $12.08 = $6.04 + $12.08 = $18.12 . The value on your bill is $66.40. If you already know how to calculate a tip, it's high time you found out what the tip calculator is. In the next paragraphs, you will learn how and why to use this tool. Type the value of your bill in the Bill field of our calculator. Type the percentage of the tip you are going to leave in the Tip field. If the service has been especially nice, you may want to increase the percentage of your tip. However, if the dishes were cold and bad or the waiter treated you with no respect, lower tip percentage is entirely understandable. The calculation is exactly the same as we have done in the previous paragraph but takes only a few seconds. Another very similar tool which can be useful in many other situations, aside from giving tip, is percentage calculator. It simply figures out the percentage of any number you type. If you are enjoying the meal with a group of friends, our gratuity calculator has an additional box where you can plug in the number of people who are going to share the bill. 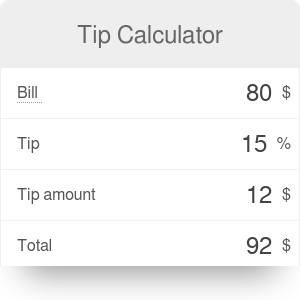 The tip calculator will automatically display the tip and total amount per person. There is one more calculator which you might be interested in if you want to calculate the tip. We are talking about the tip from net price calculator which helps not only figure out the tip amount but also calculate the gross price on the grounds of the net price and tax value. We have already mentioned that the average tip is between 10% to 20% of the total bill. However, you may wonder how much you should leave in a particular situation. The amount chosen is an individual choice and may depend on the quality of service. The range 10-20% isn't fixed as well. It may change depending on the rank of a restaurant (or any other place which belongs to the service industry). It's noticeable that customers leave higher tips when they are in a fine-dining restaurant than in a fast food restaurant. Some restaurants have an obligatory minimum tip when dining in a large group. There is also another aspect which influences the tip amount, namely the country and its culture. The rules related to paying for service vary in different places around the world. In Switzerland, for example, tipping is not expected. However, it's fair to leave 5 to 10% of the bill value. In the UK leaving a tip in a restaurant is customary while in a pub it is not. You may be greatly surprised when visiting Russia, where the most important thing is not how much you tip but that you do it in cash, directly to a waiter. Otherwise, the management may collect it for themselves. In Dubai, the tip is automatically added to the bill. In the last paragraphs of this text, we have described in more detail rules of tipping in the most popular touristic destinations. Scroll down to learn more about tipping in Spain, France, and Japan. If you want to find the percentage of the mandatory tip, you will find our percentage increase calculator very useful. This tool solves the same math problem on the basic level, but is more generic and can be used to solve different problems. At this point we already know almost everything about tipping, we can move to the last questions - when and why should we do it? Giving a tip relates to every branch of the service industry, so not only restaurants and bars, but also hotels, transportation, and delivery. That's why associating tips only with waiters and waitresses is deceptive. We should remember that maids, taxi drivers, and deliverers belong to the service industry as well. It may seem weird that we should give tips for the service we actually pay for. The reason is that people working in the service industry are usually low-paid. Their employers take it for granted that their salary will be compensated by tips. What's more, it's a commonly approved way to express your satisfaction with the service you got. Tipping is also a sign of propriety and good manners. Leaving a spot without giving a tip may be perceived as rude. That's why all the rules related to tips can be found in every Savoir-vivre book. How to tip? The answer to this question is pretty straightforward. In restaurants and cafes, you can tip by leaving the money in a folder or any type of box in which the waiter brought your bill. Tipping porters, doormen, drivers, and tour guides is even easier. You just need to hand them the amount of money you want to tip them. The only difficulty may appear when it comes to tipping a maid. You have to make it evident that money that you leave in your hotel room is the tip. Many people put money on a table with the intention to take it later, so maids think twice about considering money left in the room as a tip. You can make it easier for them by enclosing an explanatory note or placing the money in the middle of a cushion. Now you know when, why and how to tip! If you enter the advanced mode of our gratuity calculator, you will find a new functionality – pizza tip calculator. It will tell you how much each person around your table should pay and tip, depending on a number of pizza slices eaten. Your friends on a calorie restricting diet (maybe they have discovered our body fat calculator?) or just with a small stomach may finally rest easy, while pizza-devourers should start trembling with fear. The justice has finally come to your table! How to use the pizza tip calculator? Firstly, type in the Bill field the price of your pizza. You will get the tip and the total cost you and your friends will have to pay for your dinner instantly. Don’t forget that you can freely change the tip percentage. You may want to gratify your waiter for especially good service. Secondly, click the advanced mode button at the bottom of the calculator. New fields and the option of the pizza tip calculator should emerge immediately. While your pizza is still hot, count the total number of slices and input it into the Number of slices field. You will receive the price of one slice (tip included). Set the number of people with whom you are sharing the pizza in the Number of people eating field. 2 is set as a default. If you are not on a date 😉, you can increase it up to 6. Now, all that is left to do is to type in the number of slices eaten by each person (in their own subcategory). For your curiosity, you may want to check what ratio of the pizza was eaten by each of you. You can do it with our ratio calculator. Our pizza tip calculator will do the math for you and provide you with the cost each of you and your friends should pay. How much to tip pizza delivery? If the party is at your place, you will save on tipping the waiter. However, if the delivery was fast and pizza is still hot, you should tip the delivery man (or lady) $3 for orders below $20 and 10% to 15% of orders over $20, as a kind gesture. If you are a pizza addict like us, you have to visit our other calculators concerning the world of pizza. We have the perfect pizza calculator to help you cook the perfect pizza. Also, our pizza party calculator will tell you how many boxes of pizza you should order to assure that everyone at your party will fill his or her stomach. Don't forget our pizza size calculator will help you decide what is more cost-efficient: ordering two small pizzas or one large. It calculates areas, circumferences, and other complicated geometrical properties to make sure that you will not overpay for your meal! Although these two countries are divided “only” by the Atlantic Ocean, principles of tipping in Spain look substantially different than in the USA. In Spain tipping is accepted, often appreciated but not expected. The reason is that Spanish waiters and waitresses earn comparatively more than their American counterparts and do not have to rely on extra money received from customers. In the Spanish restaurants during the daytime, it is perfectly fine to tip 1 euro per person. At nighttime, when Spanish streets are thronging with life, people go out to feast, and a tip of 5% - 10% for an excellent service, especially in a fancy restaurant, is highly appreciated. When it comes to paying for beer in a pub or coffee in a café, there is entirely no need to tip. In fact, it would not even come to the minds of locals to tip for such a thing. The only thing that you can do is to leave the change. For example, if the bill is 4,90 euro and you pay with 5 euro coin, you may leave the 10 euro cents on the table. When you go “de Tapas”, visiting many places in one night, it would be crazy to leave a significant tip everywhere. Taxi and bus drivers don’t expect a tip but will be happy to receive one (e.g., after helping you with carrying your bags). Probably the most common places to tip in Spain are hotels. The American culture of tipping has come to this sector of Spanish industry already. In Spanish hotel you should tip: porter for carrying your luggage (1 euro per bag), room service personnel for meal delivery (1 - 2 euros), maids for tidying up the room (2 – 4 euros per day) and doorman for halting a cab and helping you with loading the bags (1 – 2 euros). Don’t forget about the tour guides! An exciting trip around the town should be gratified with a bigger tip (5 euros if you are a part of a larger group, 10 – 15 euros if the trip was more private). Now you know everything about tipping in Spain! Tipping in France is more or less the same as tipping in Spain. You also don’t have to tip, but it will be very appreciated if you do so. However, there are some minor differences. First of all, you should know, that there always will be a service charge included in your bill. Owners of the restaurants should pass this money onto waiters and waitresses. Unfortunately, there may still be places that do not follow this rule. Leaving a tip of 5% to 10% (or 1 – 2 euros per 20 euro if you will) will be perfect. If you find your service slow, remember that French people highly value the experience of an unrushed meal. It is a standard for them so don’t feel disrespected. Similarly to rules of tipping in Spain, leaving a small change in cafes and pubs is fine, too. During intense sightseeing, a coffee break will give you a necessary boost of energy. Our coffee kick calculator will tell you how long this state of high alertness will last. France is considered to be a very classy country with people caring about their looks. As expected, they appreciate the work of their hairdressers and tip around 10% for a new haircut. When it comes to taking a taxi, you should follow the same rules as in the USA and tip a driver 5% to 10% of the fare. In hotels, tipping in France is pretty straightforward. You should tip porter 1 - 2 euros for each bag he carries for you, maids 1 – 2 euros after each day, room service 1 – 2 euros for every order, and doormen 1 euro for halting a taxi. As always, let’s don’t forget about trip guides! They should receive about 10% of the trip price. If you are accustomed to the culture of tipping in the USA, a journey to Japan might be a shocking experience for you. Basically, there is no tipping in Japan! Japanese believe that people should give their best at work as a standard, thus why should they receive some money for extra effort? It’s quite admirable, isn’t it? Apart from some hotels that are used to hosting travelers from western countries, your tip will not be appreciated and might even get rejected. The sole occasion in which tipping in Japan will be well received is when tipping a tour guide. However, you will have to follow some specific rules. You should avoid tipping with money. It will be better to bring a gift or a souvenir from your homeland. Inviting your guide for a cup of tea or coffee is also fine. If you necessarily want to use the money, put it inside an envelope and hand it to your tour guide using both hands. Are you planning to visit Japan soon? After a flight to the land of the rising sun, you may suffer from jet lag. It takes some time for our bodies to get used to the new time zone. You can help normalize your sleep by using our sleep calculator. Mateusz Mucha, James Mathison and Kacper Pawlik. Tip Calculator can be embedded on your website to enrich the content you wrote and make it easier for your visitors to understand your message.